We have over 2,000 computers for students across our campuses: about 800 of these are in locations accessible to everyone. To help our students find a free computer we take information from our IT suites about how many computers are in use and how many are currently available. We display this information around campus on our IT suite availability screens. Many of our IT suites can also be booked using the central room booking system. Our existing availability screens weren’t able to show room booking information, so a room which might not be available due to a class being taught might well show as having computers available to use. 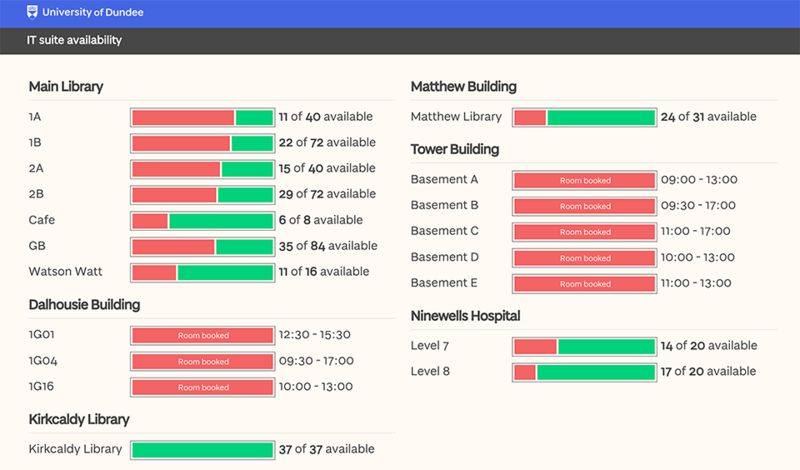 Based on feedback about this issue we’ve revamped the screen to include room booking information and taken the opportunity to make the screen more accessible and easier to get the information you want at a glance. Suites now show when they are booked. Suites will show bookings up to 15 minutes in advance and will let you know when the booking starts and ends so you know when the room is free again, consecutive bookings are taken into account so you should see the time the room is actually free again not just when the current booking ends. The display has been optimised to take full advantage of the newer high definition screens we now have across campus, this lets us make the text larger and easier to read as well as give more impact to the key pieces of information. We’ve also taken the opportunity to bring the screens in line with our University of Dundee brand styling with the updated visual style making it much easier to see where there is availability at a glance. The information about the Kirkcaldy Campus library is incorrect – we have 11 PC’s in the library and the rest are in the IT suite at Kirkcaldy Campus. 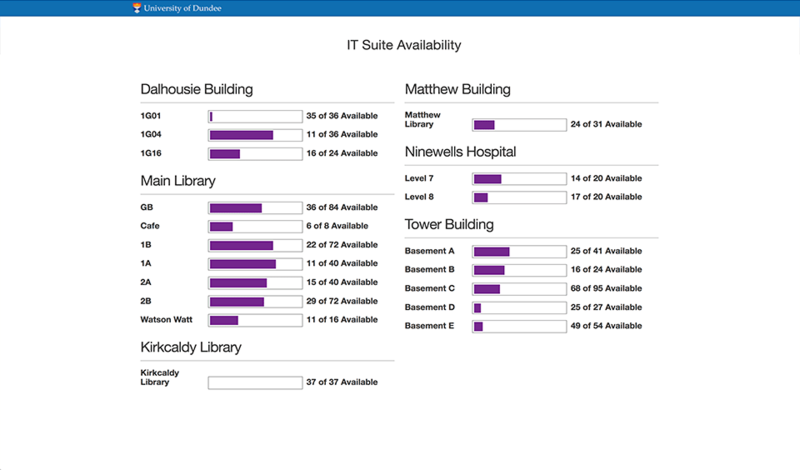 Would it be possible to split the information shown on the availability screen or change the name from Kirkcaldy Library to Kirkcaldy Campus to make it clearer for the Fife students. Thanks Gillian for pointing this out. We’ll need to get in touch with IT to get the data in LabStats changed and then we can update the screen. Hi Gillian, we were able to get the room information updated centrally and so Kirkcaldy library should now be showing correctly with 11 machines in the library and another 26 in the IT suite.